After a five-day Book Sprint, a group of ten contributors finished the book Treasure Hunt – How Good Financial Governance can support resource-endowed countries in achieving the SDGs. 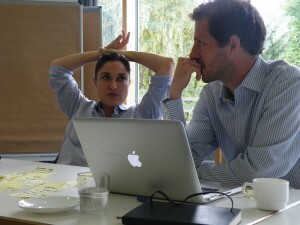 Amidst rain and sunshine (but more rain), with the river Rhine swelling until it flooded the banks behind the GIZ academy’s garden, the participants stayed inside and worked long days (and some long evenings, too). From Monday to Friday they conceptualized, structured, wrote, discussed, re-wrote and edited the book on good financial governance in the extractive sector. Photos of the Book Sprint can be seen here on flickr.